Home made pie. Those few words will invariably bring a smile to my face and I don’t think I am alone in this. There are some people who will say that a mass produced pie cannot taste the same. Take The Pie Kitchen who we reviewed recently, they refuse to stop making their pies at home in the kitchen because they don’t think they can taste the same. I have been looking for pies to add to our list of the best pies in Suffolk. 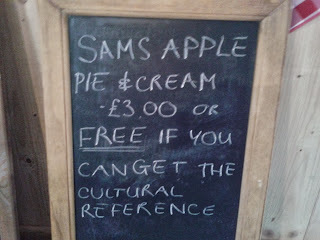 Hence I was delighted to find a chalk board advertising home made ‘Sam’s Apple Pie’ at the Flying Goose Café which is part of Yoxford Antiques Centre in Suffolk. 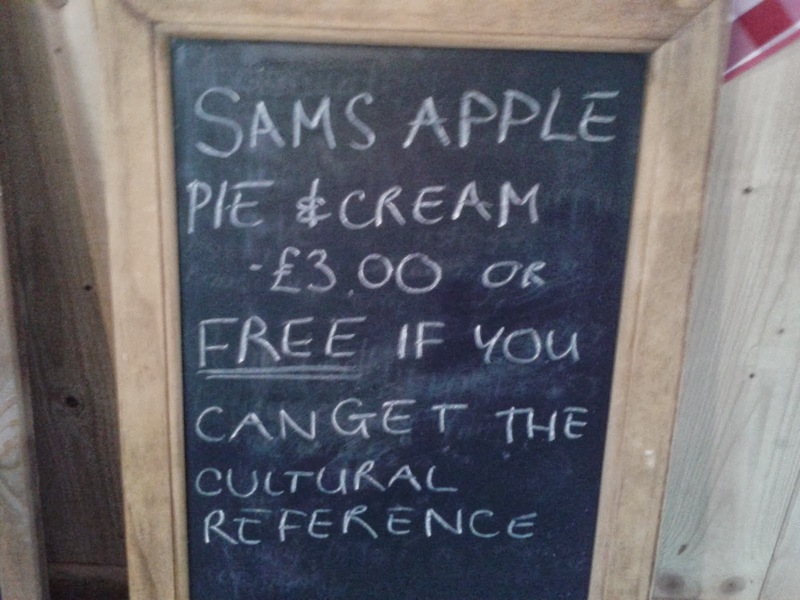 Why they called it ‘Sam’s Apple Pie’ I have no idea and the sign hooked me in by promising free pie if you could guess the cultural reference in the name. Sadly my knowledge of pie didn’t help me out, I had no clue as to the answer, but I decided that pie was worth paying the £3.00 for. Upon arrival I could tell this was a home made pie straight away. It arrived in good condition but had a slightly irregular shape. The top of the pie seemed to be supported by the apple underneath. This certainly didn’t detract from the taste. The pastry was soft, crumbly shortcrust, just what I like to see with a sweet pie. The apple was firm which gave the pie a wonderful texture. The apple tasted nice on its own but the additional cinnamon and cloves complemented it nicely, if perhaps the clove taste was boardering on too much. All in all the pie slipped down well as a before lunch snack and it was nice to sit outside amongst the random assortment of antiques, it certainly was different to the usual places I eat pies. Once I finished the pie I went back inside and asked to take a picture of the whole pie. I then learnt that it had been made by the owner of the antique centre, Mr Goose which explained the name of the café. 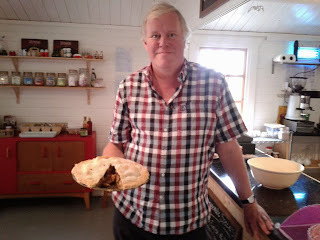 He was pleased to have his photo taken with the pie and explain the local ingredients he had used in it. I certainly hope he doesn’t get too busy running the centre to make the pies himself. The only feedback I would give is that the shape of this pie was somewhat unusual. While the pie certainly had a clear base and lid, the sides weren’t very well defined and it got worryingly thin towards the edge. However, on this occasion I overlooked it (as I hadn’t even realised when eating the pie). My complements go to Mr Goose who proved that you can find great pies in completely unexpected places! Keep your eyes out for pies! 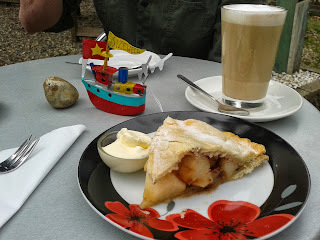 See where this pie ended up in the our Suffolk Pie Leaderboard and our overall Pie Rankings.